First look at the live-action / gameplay hybrid. Square Enix debuted the over 40 minutes of gameplay footage from The Quiet Man during a live stream today. While the game eliminates sounds, it is not entirely soundless. Special sound effects are being prepared when you hit enemies or take hits from enemies during action parts. It should also be noted that although there is no user interface with an HP bar or anything of the sort, the color of the screen will change depending on your physical condition, and the lens flare on the right side of the screen acts as a meter that enables the activation of “Focus Mode” when it changes to blue. During Focus Mode, you can unleash extremely powerful attacks. In total, The Quiet Man will run at about three hours in length. For that reason, it will only cost 1,800 yen (in Japan). It will be released digitally for PlayStation 4 and PC via Steam. Watch the footage below (from 39:31 to 1:22:42). Update 12:45 p.m.: Square Enix has released the second official message from producer Kensei Fujinaga, who explains how they plan on delivering a memorable experience in a small package. Get the message below. 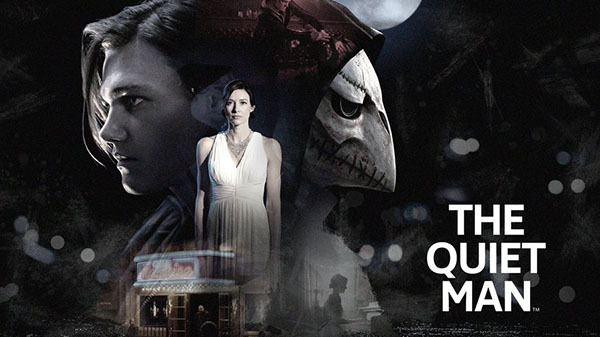 The Quiet Man is an extremely indie style title, of the kind that we did not have before in our Square Enix brands. I sometimes feel that games often repeat the same things within a narrow area of what has been proven to work. At th esame time, lots of titles from small indie develoeprs have emerged in recent years. Many of these challenge the status quo, and it is hugely stimulating to see how they make new propositions towarsd the very concept of what digital entertainment in the form of a video game can be, displaying wonderful freedom and purity, I personally love the big games that are commonly referred to as “triple A,” and there are many major series that I always eagerly await the next installment of. releasing even one game on that scale cannot be done without an uncommon level of effort. However, it does not follow that all games need to be triple A productions. I sometimes ask myself, “Hey, why couldn’t a game be like that?,” wanting to provide new forms for games to take, even if it is on a smaller scale, and not being afraid to take on new challenges. You could probably call The Quiet Man a crystallization of that whole indie ethos. In addition to its somewhat reckless concept of rejecting sounds and words completely, The Quiet Man is also a game that strives to find new kinds of balance. The price of $14.99 is based on the standards for selling films, with graphical quality that is way above what one would usually expect from that price, the extremely compact play time of around three hours that we determined was needed to realize such high quality and the bold balancing between “watching” and “tactile experience” that pivots around savoring and unraveling the game’s story… these were the new challenges we took on, with the full understanding that others may well laugh them off as stupid. The Quiet Man is a very small game. However you look at it, it will never be an opulent and ornate treasure box, sparking with all the colors of the rainbow. However, if this tiny, tiny stone that represents a frankly disproportionate level of challenge and experimentation from my modest team, can shine brightly like a diamond in the hearts of our players out there, I would safely say that there could be no greater joy for us than that.